In 2017, work started on a Community heritage project that could reflect the lives and experiences of the people of Youghal, and present the memories of the residents of Youghal’s first four social housing estates: Sarsfield Tarrace, Balckwater Heighhts, Dermot Hurley and Raheen Park. A number of agencies offered their support in helping the lead partners of Youghal Residents Network & Cumann na Daoine’s Local Community Development Worker to collaborate with the residents themselves in styling a project that truly reflected their lives in the estates of Youghal. The Community Heritage Project is led by Cumann na Daoine, with a Working Group made up of Youghal Residents Network; local photographers/historians; Cork County & Municipal Councils; Community Radio Youghal; Youghal Tourism and Earchtra. The project focuses on the first four estates to be built in Youghal: Sarsfield Terrace, Blackwater Heights, Raheen Park and Dermot Hurley. The aim of a Community Heritage Project is to preserve the stories and experiences of ordinary people and the lives they have lived in this area. Other heritage projects focus on trade and commerce and historical events – often the voices of ordinary working people aren’t heard. This project is an opportunity for the stories that make up people’s lives to become part of local history in one form or another. Creative ways of recording these community experiences will benefit local people, family members abroad and new residents, helping them value their own history and the experience of creating communities in Youghal. The Stage 1 Working Group, Stage 2 Steering Group and the Stage 3 Top of the Hill collaborators are creating ways to bring residents of these estates together to firstly identify stories and themes that reflect the strong communities of these estates, and secondly to help residents (and former residents!) agree methods of recording or memorialising these stories for future generations. The Working Group will identify the resources needed to bring these plans to fruition after a process of discussion, sharing experiences and planning. Stage 1: Living Memories Public Event. 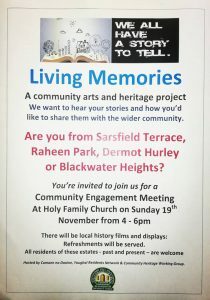 Over 60 people came along to share stories and memories of life on the estates. Some recordings were made and Community Radio Youghal (CRY) gave a live broadcast with some storytellers. Recordings from the day, along with subsequent recordings conducted at CRY studios, are ready for editing onto a CD.